The first full part of the series, "Year Zero", comprises 8,761 documents and files from an isolated, high-security network situated inside the CIA's Center for Cyber Intelligence in Langley, Virgina. It follows an introductory disclosure last month of CIA targeting French political parties and candidates in the lead up to the 2012 presidential election. Recently, the CIA lost control of the majority of its hacking arsenal including malware, viruses, trojans, weaponized "zero day" exploits, malware remote control systems and associated documentation. This extraordinary collection, which amounts to more than several hundred million lines of code, gives its possessor the entire hacking capacity of the CIA. The archive appears to have been circulated among former U.S. government hackers and contractors in an unauthorized manner, one of whom has provided WikiLeaks with portions of the archive. "Year Zero" introduces the scope and direction of the CIA's global covert hacking program, its malware arsenal and dozens of "zero day" weaponized exploits against a wide range of U.S. and European company products, include Apple's iPhone, Google's Android and Microsoft's Windows and even Samsung TVs, which are turned into covert microphones. The EDG is responsible for the development, testing and operational support of all backdoors, exploits, malicious payloads, trojans, viruses and any other kind of malware used by the CIA in its covert operations world-wide. The increasing sophistication of surveillance techniques has drawn comparisons with George Orwell's 1984, but "Weeping Angel", developed by the CIA's Embedded Devices Branch (EDB), which infests smart TVs, transforming them into covert microphones, is surely its most emblematic realization. As of October 2014 the CIA was also looking at infecting the vehicle control systems used by modern cars and trucks. The purpose of such control is not specified, but it would permit the CIA to engage in nearly undetectable assassinations. The CIA's Mobile Devices Branch (MDB) developed numerous attacks to remotely hack and control popular smart phones. Infected phones can be instructed to send the CIA the user's geolocation, audio and text communications as well as covertly activate the phone's camera and microphone. Cyber 'weapons' are not possible to keep under effective control. While nuclear proliferation has been restrained by the enormous costs and visible infrastructure involved in assembling enough fissile material to produce a critical nuclear mass, cyber 'weapons', once developed, are very hard to retain. Over the last three years the United States intelligence sector, which consists of government agencies such as the CIA and NSA and their contractors, such as Booz Allan Hamilton, has been subject to unprecedented series of data exfiltrations by its own workers. A number of intelligence community members not yet publicly named have been arrested or subject to federal criminal investigations in separate incidents. In addition to its operations in Langley, Virginia the CIA also uses the U.S. consulate in Frankfurt as a covert base for its hackers covering Europe, the Middle East and Africa. CIA hackers operating out of the Frankfurt consulate ( "Center for Cyber Intelligence Europe" or CCIE) are given diplomatic ("black") passports and State Department cover. The instructions for incoming CIA hackers make Germany's counter-intelligence efforts appear inconsequential: "Breeze through German Customs because you have your cover-for-action story down pat, and all they did was stamp your passport"
The CIA made these systems unclassified. 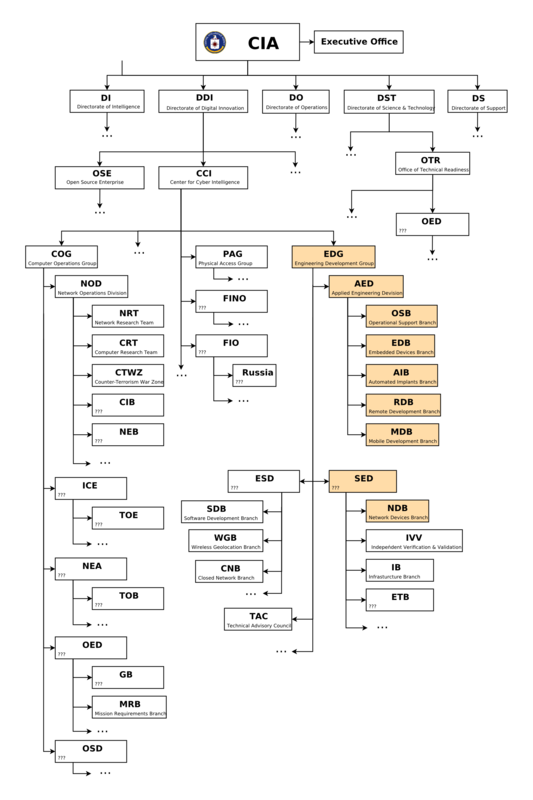 Why the CIA chose to make its cyberarsenal unclassified reveals how concepts developed for military use do not easily crossover to the 'battlefield' of cyber 'war'. The years 2013 to 2016. The sort order of the pages within each level is determined by date (oldest first). WikiLeaks has obtained the CIA's creation/last modification date for each page but these do not yet appear for technical reasons. Usually the date can be discerned or approximated from the content and the page order. If it is critical to know the exact time/date contact WikiLeaks.